To better understand the association of contaminant uranium with natural organic matter (NOM) and the fate of uranium in ground water, spectroscopic studies of uranium complexation with catechol were conducted. Catechol provides a model for ubiquitous functional groups present in NOM. Liquid samples were analyzed using Raman, FTIR, and UV-Vis spectroscopy. Catechol was found to polymerize in presence of uranyl ions. 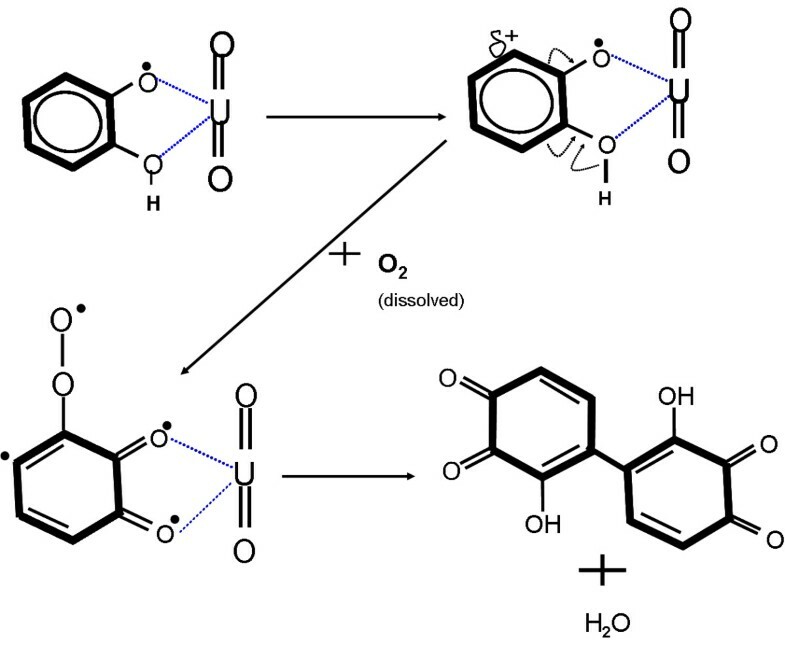 Polymerization in presence of uranyl was compared to reactions in the presence of molybdate, another oxyion, and self polymerization of catechol at high pH. The effect of time and dissolved oxygen were also studied. It was found that oxygen was required for self-polymerization at elevated pH. The potential formation of phenoxy radicals as well as quinones was monitored. The benzene ring was found to be intact after polymerization. No evidence for formation of ether bonds was found, suggesting polymerization was due to formation of C-C bonds between catechol ligands. Uranyl was found to form outer sphere complexes with catechol at initial stages but over time (six months) polycatechol complexes were formed and precipitated from solution (forming humic-like material) while uranyl ions remained in solution. Our studies show that uranyl acts as a catalyst in catechol-polymerization. Uranium is present in our environment due to its natural occurrence, mining, processing and subsequent use. Radionuclides from mill sites, nuclear facilities and waste disposal sites can be spread by air and groundwater which necessitates the study of uranium transport and reactions in the environment: a number of such studies have been conducted [1–8]. Many factors affect the speciation and transportation of uranium in soil and groundwater including minerals in soil, nature and amount of organic matter in soil, pH of soil and water, rate and direction of groundwater flow, and hydraulic gradient. Contaminant uranium in the subsurface has been found in very diverse forms including as uranyl phosphate, uranyl hydroxide, and an ill-defined uranyl organic phase at Fernald . In studies conducted at Oak Ridge National Laboratory, uranyl has been found to exist complexed with phosphates and carbonates, associated with iron and manganese phosphates , and complexed with soil organic matter . Humic substances form the majority of natural organic matter (NOM) in soil. Humic substances are high molecular weight, naturally occurring complex aggregates of aliphatic and aromatic chains having a number of common functional groups. Humic substances interact with metal ions through functional groups, forming soluble complexes, precipitating metal ions by reduction or by ion exchange, modifying the sorption behavior of mineral surfaces towards metal ions and modifying colloidal particles containing metal ions . More than 40 binding sites for complexation have been reported for humic materials including carboxylate, carbonyl, polyphenolic and amine functional groups . Catechol (o-diphenol benzene) is the simplest aromatic molecule containing highly reactive diphenol groups similar to many larger polyphenols constituting humic material, which makes catechol an ideal candidate for study of metal ion association relevant to contaminant mobility in soils. Due to its common presence as a functional group in NOM, catechol is also an ideal candidate for the study of oxidative polymerization . Oxidative polymerization is an important process to understand because of its role in humic polymers originating from decomposition of plant residue . In addition to the relevance of using catechol as a model ligand to understand reactions of mobile metal ions with subsurface organic constituents, catechol itself in the subsurface originates from both natural and man-made sources. It is produced in nature by bacterial degradation of plants and animals . Catechol and other phenolic compounds are produced by many chemical industries and need to be removed from wastewater discharged by those industries . While catalytic polymerization of catechol was first demonstrated by Ziechmann using silica , it has also been observed using alumina, FeO, MnO, Ag2O, soil, silver colloids  and various enzymes, including laccase , horseradish peroxidase and soybean peroxidase . These enzymes, along with an oxidizing agent (hydrogen peroxide/dissolved oxygen), oxidize phenols to the phenoxy radical. In turn, the generated phenoxy radicals associate to form dimers, trimers and polymers . Abiotic oxidative polymerization of phenolic compounds was investigated by Colarieti et al. al using soil samples, and it was established that both soil and dissolved oxygen are required for polymerization . These authors later formulated a three step mechanism for abiotic oxidation of catechol: (1) catechol is oxidized by metal oxide(Fe and Mn oxides) and the metal oxide is reduced (2) complexation occurs between the reduced metal and remaining catechol, and (3) the metal-catechol complex is oxidized by dissolved oxygen to form polymers . In this study we have investigated uranyl (UO22+) interactions with catechol using spectroscopic techniques including Raman, FTIR and UV-vis spectroscopies. Catechol was found to polymerize in the presence of uranyl. 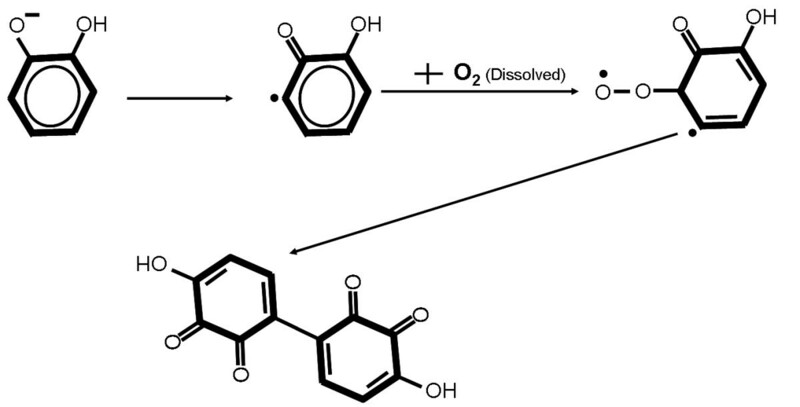 Catechol polymerization was further investigated for effects of pH and dissolved oxygen and presence of other oxyions. Molybdate was used for comparison as it is well known oxidizer, and molybdenum is a known catalyst for benzene hydroxylation . Moreover, molybdenum occurs naturally with uranium and is present in the form of MoO42- in leach solutions generated during hydrometallurgical extraction of uranium . Molybdenum is also present in spent fuel rods formed by fission of uranium and beta decay of niobium, where it is found that Mo6+ converts to MoO22+ under oxidizing condition with an ionic potential similar to UO22+ . For these reasons as well as the fact that molybdenum itself is a contaminant in groundwater makes molybdate an ideal candidate for comparison with uranyl. 0.1M aqueous solutions of catechol (o-dihydroxybenzene, Aldrich chemical Corp.), uranyl nitrate(Analar, BDH Chemicals Ltd.) and sodium molybdate(Aldrich Chemical Corp.) were prepared by dissolution in DI (>18MΩ/cm) water. To obtain complexes, catechol was added to uranyl nitrate and sodium molybdate in 1:1 volume ratios. All the solutions as well as 1:1 molar ratio complexes were adjusted to 2, 4, 6, 8, 10 and 12 pH using 1M and 0.1M NaOH and HCl solutions. The pHs of solution were measured using a Corning Scholar 425 pH meter. Solutions and complexes were analyzed using UV-Vis, Raman and IR-ATR spectroscopy. Spectra of solutions of uranyl nitrate and sodium molybdate at various pH were taken before spectra of uranyl-catechol and catechol-molybdate to distinguish effects of complexation from the effect of pH change. A Nicolet Model Magna 760 FTIR spectrometer with a ZnSe ATR crystal was used for analysis. Solutions containing complexes were placed on the crystal (in their liquid state). A 4 cm-1 resolution was used and 256 scans were averaged to improve the signal-to-noise ratio. The range selected for data acquisition was 3000-900 cm-1 (below 900 cm-1 noise was too high for meaningful signal to be observed). DI water (>18MΩ/cm) was chosen as background to minimize signal from water peaks during data collection. A Nicolet Almega dispersive Raman spectrometer with a 785 nm laser source was used for analysis. Samples were put on a gold slide as droplets and the Raman microscope was focused at the gold-solution interface. Data from averaging 256 scans in the 3444-108 cm-1 range was collected. OMNIC for Nicolet Almega software version 7.3 was used to process data. UV-Vis measurements were taken using an Ocean Optics S2000 spectrometer and OOIBase32 operating software. For UV-Vis measurements 1 mM samples were used; deionized water was used as reference spectrum. Spectra were collected with 80 mSec integration time with an average of 10 measurements. For anaerobic UV-Vis measurements 1 mM catechol solution was deaerated by bubbling nitrogen through the solution for four hours. NaOH pellets were then added to solution until pH was greater than 12 while the solution continued to be deaerated with nitrogen. This anaerobic catechol solution at high pH was then transferred to a quartz cuvette and which remained capped for the initial measurement: for subsequent readings the cap was removed to allow air to interact with the solution. FTIR analysis (Figure 1) of uranyl nitrate at different pH shows a shift to lower wavenumbers of the peak associated with the U = O antisymmetric stretching frequency of uranyl with an increase in pH, shifting from 961 cm-1 at pH 2 in solution to 942 cm-1 in the precipitate formed at pH 6. On further increasing the pH the signal became lost in the background noise. FTIR spectra of uranyl ion in solution at pH 6 and precipitate at pH 6. The observed shift is likely due to the presence of a greater number of hydroxyl ions coordinated with the uranyl ion, due to of the formation of different uranyl hydroxides at different pHs. In general there are more than 20 uranyl oxide hydrates  which may be formed at elevated pH. Uranyl hydroxide was found to have precipitated out of solution at high pH as indicated by the disappearance of the uranyl peak in spectra from solution at pH 6 and its subsequent appearance in the precipitate. 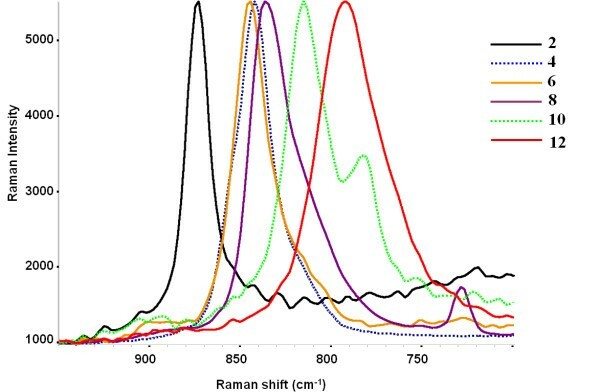 Raman analysis (Figure 2) showed similar results: there is a significant decrease in stretching frequency of the U = O uranyl peak from 875 cm-1 at pH 2 to 794 at pH 12 (observed in solution up to pH 4 and in precipitate from pH 6-12). This decrease in frequency is a known indicator of complexation, and indicates the presence of various uranyl hydroxides . Samples were stored in closed containers limiting the amount of atmospheric carbon dioxide absorption by solution to avoid formation of uranyl carbonate. No peaks corresponding to uranyl-carbonate (1117 cm-1), even at high pH, were found. Raman spectra of uranyl ion in solution at pH 2 and 4 and in the precipitate formed at pH 6, 8 10 and 12. Raman spectra from the molybdate solution (Figure 3) also show a shift in the peak associated with the Mo-O vibrational frequency in molybdate from 960 to 902 cm-1 with increase in pH, but the change in frequency with pH is not gradual as in the case of the uranyl peak. The peak at 960 cm-1 starts to lose intensity for pH greater than 4 while a new peak at 902 cm-1 gains intensity to pH 6: there is no peak at 960 cm-1 at pH 8 and above. This shift is due to the fact that molybdate structure changes with pH in basic and neutral solutions: it normally exists as simple tetrahedral molybdate ion, but at pH lower than 6 it exists as heptamolybdate [Mo7O24]6-. This transition is complete at pH 4.5 . Raman spectra of molybdate ion In solution at pH 2, 4, 6 and 8. The 0.1 M catechol solution was found to become increasingly opaque with increasing pH. The solution first became brown in appearance at pH 6 and, on further increasing the pH to 8 or higher, it turned black (Figure 4). UV-Vis spectra of the solutions show a peak in the range of 250-300 nm at all pHs: this is characteristic of π-π* electron transitions in phenolic compounds. 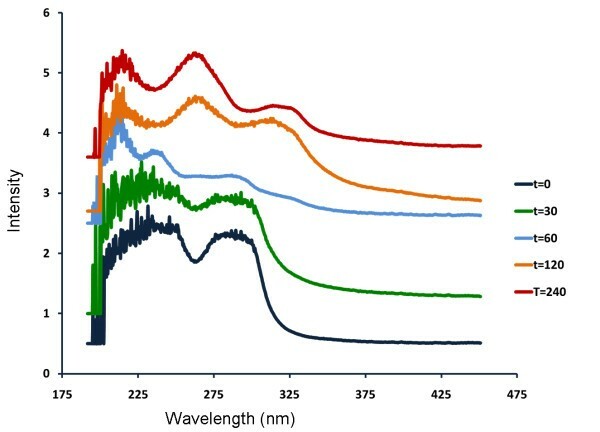 The change in color of the catechol solution was found to be associated with a bathochromic shift and an increase in intensity in the UV-vis absorption spectra indicating a greater degree of π-conjugation and thus polymerization [30–32] (Figure 5). A new peak ~320 nm emerges at higher pH indicative of formation of a higher molecular weight polymer at higher pHs [33, 29]. Catechol solutions (0.1 M) at pH 2,4,6,8,10 and 12 (left to right). 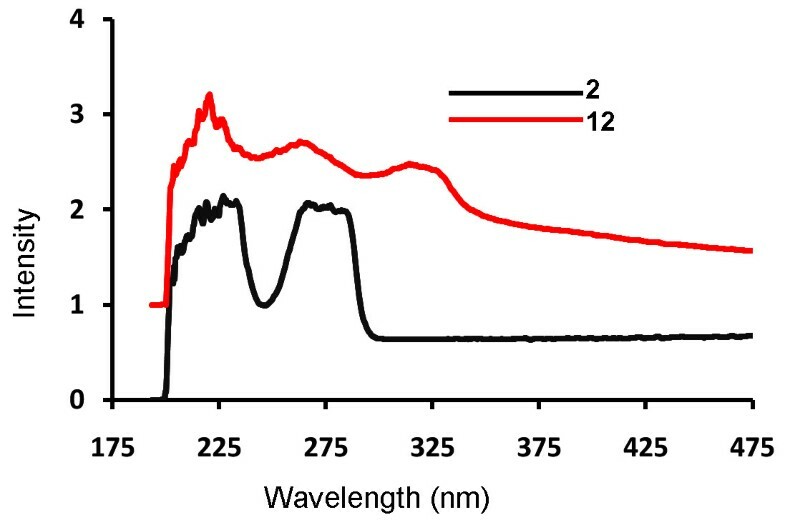 UV-Vis spectra of catechol solution at pH 2 and 12. 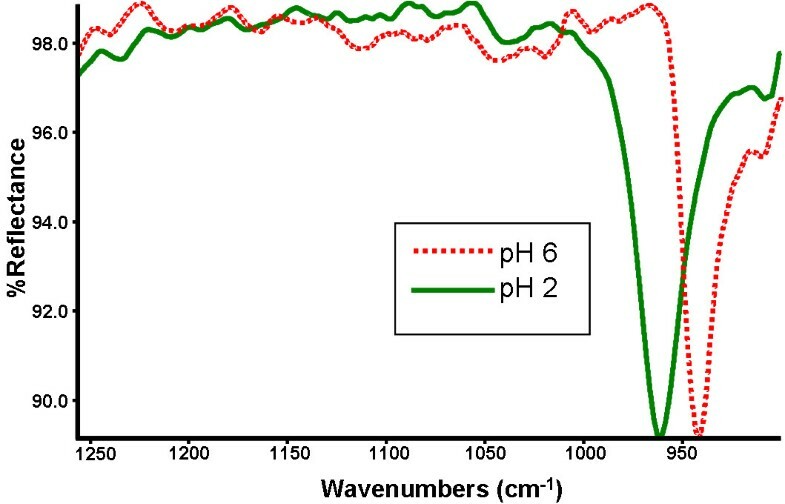 Dissolved oxygen was found to play a role in polymerization, since in absence of oxygen no change in color associated with polymerization was observed even at pH as high as 12. In addition, the UV-Vis peak at 320 nm is initially absent (figure 6 at t = 0). The peak slowly emerges as air is allowed to interact with the solution and can be clearly seen after four hours (t = 240). UV-vis spectra showing polymerization of catechol in solution at pH 12 with exposure to air with time. FTIR analysis (Figure 7) of the catechol solution at pH 2 and pH 12 shows clear evidence of the formation of polycatechol. The four absorption peaks between 1466 and 1515 cm-1 may be attributed to aromatic ring C = C vibration bands characteristic of the benzene ring. Peaks at 1277 and 1260 cm-1 are due to C-O vibration . The broad peak at 1600 cm-1 is a combination of C = C and substituted benzene ring vibrations. Peaks at 1202 and 1102 cm-1 observed at pH less than 6 are attributed to C-H in-plane vibrations. Analysis from the solution at pH 12 showed C = C vibration bands between 1410-1584 cm-1, consistent with the formation of polycatechol. The peak at 1487 cm-1, found to appear at pH higher than 8, is attributed to substituted benzene ring vibrations (which is indicative of catechol chelation and/or higher substitution). In addition, peaks associated with C-H vibrations were not found in spectra from the pH 12 solution. Raman analysis (Figure 8) of catechol at different pH is also consistent with the formation of polycatechol. The spectra for lower pH (2,4,6) solution show in-plane and out-of plane CH deformation bands at 1040 and 774 cm-1. These peaks are absent at higher pH (8, 10, 12). A new peak associated with the phenoxy radical appears at 1494 cm-1. New peak at 1382 cm-1 associated with in plane C-H rocking vibration was also observed indicating retention of some C-H bonds in polycatechol. In addition, a new peak was observed at 1584 cm-1 indicating formation of tropones. From this evidence it appears polymerization is taking place by formation of C-C bonds between benzene rings following deprotonation of catechol. Pka for catechol is 9.5; thus at pH 8, approximately 3% of the catechol will be deprotonated, likely enough to start polymerization (figure 9). 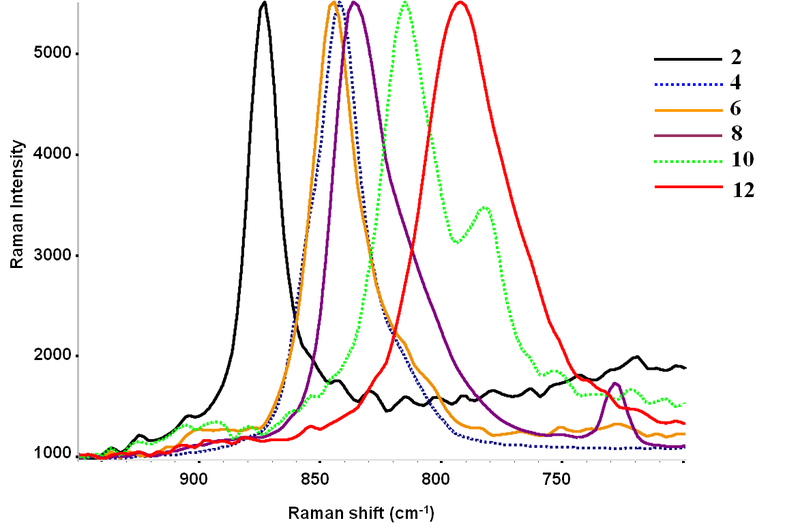 Raman spectra of catechol and polycatechol at Ph 2, 6 and 12. Proposed mechanism of initiation of catechol polymerization at high pH. Addition of uranyl ion to catechol solution was found to induce polymerization at a significantly lower pH than the pH required for polymerization in a pure catechol solution: the uranyl/catechol solution was found to become dark instantaneously at pH 6. 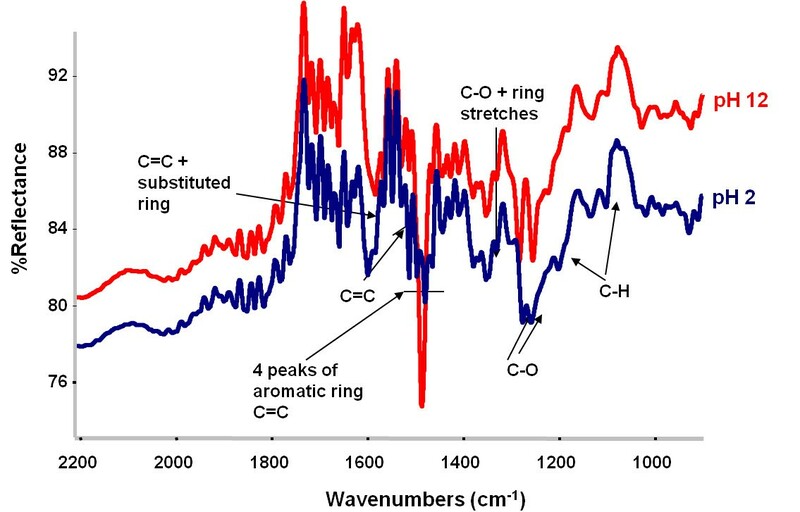 FTIR spectra of the uranyl/catechol solution (Figure 10) shows proof of complexation by increase in intensity of the peak due to the substituted benzene ring at 1488 cm-1 as well as an increase in intensity of the peak associated with the C-O band at 1252 cm-1. 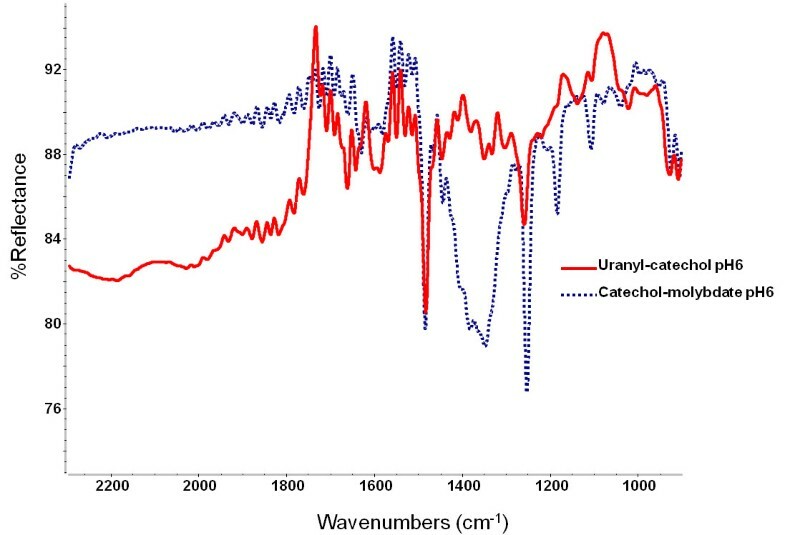 No major difference in spectra was observed between solutions of 1:1 and 1:2 ratio of uranyl:catechol. 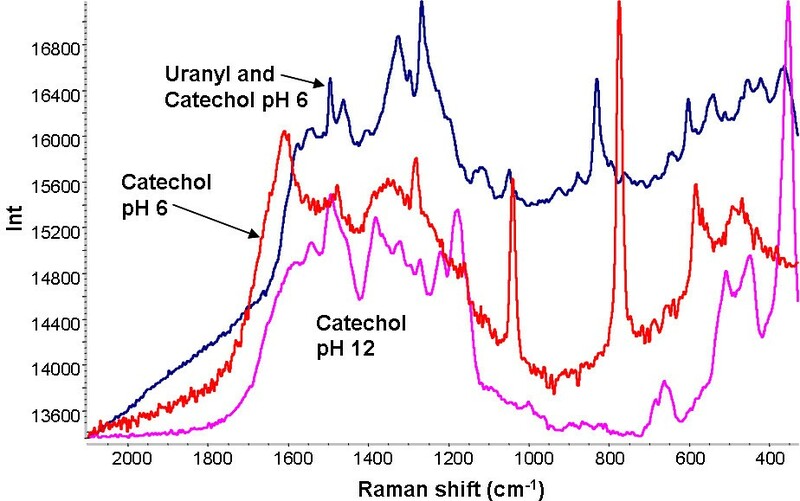 Raman spectrum (Figure 11) from the uranyl-catechol solution confirmed polymerization at low pH: C-H bands at 1052 and 774 cm-1 were present only at pH 2. The shift in the C = C peak to 1582 cm-1 as well as the appearance of the peak associated with phenoxy groups at 1497 cm-1 were observed at pH as low as 2. By visual observation it appeared that sodium molybdate had a similar and more intense effect on catechol than uranyl nitrate, as color change was observed even at pH 2 in fresh solution (as opposed to the requirement for a pH 6 for the uranyl-catechol solution). Molybdate is capable of catalyzing polymerization at even more acidic pH due to its high affinity for aromatic o-dihydroxy compounds  as shown by the FTIR spectrum of the molybdate/catechol solution. At pH 6 (Figure 10), the substituted benzene ring intensity at 1483 cm-1 increased accompanied by a larger increase in the C-O band at 1264 cm-1 than in the case of uranyl association with catechol at pH 6. The results indicate that oxygen substitution is much faster in presence of molybdate as opposed to uranyl at acidic pH. 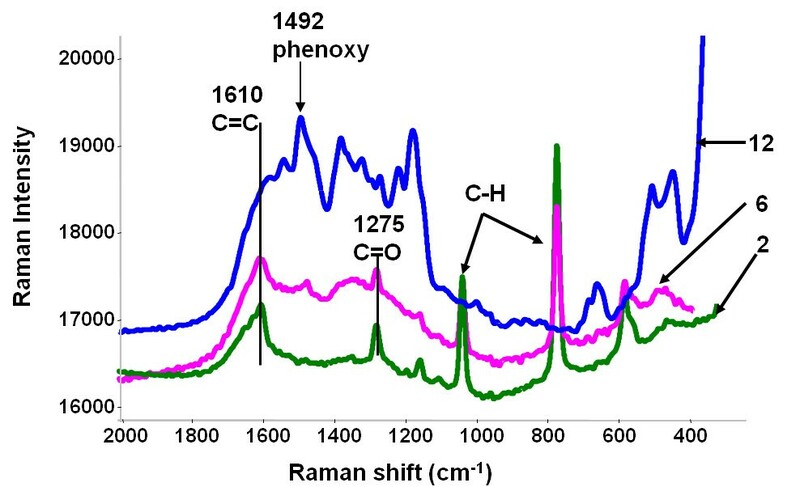 In the Raman spectrum (Figure 11) from the molybdate/catechol solution, C-H bands were not present at any pH, and the C = C peak was shifted to 1563 cm-1 showing substitution and conjugation. The peak associated with Mo = O stretching in molybdate was also shifted from 900 to 932 cm-1 showing evidence of complexation with catechol. In all cases, whether by pH-induced polymerization of pure catechol solution or whether catalyzed by uranyl or molybdate ions at lower pH, it seems the mechanism of catechol polymerization is by formation of C-C bonds between benzene rings and not by C-O-C bond formation, as characteristic peaks of benzyl ether1090 cm-1 were not observed in any case. Polymerization is associated with a high degree of substitution in the benzene ring as proposed by Arana et al. and with formation of quinones . No polymerization was observed under anaerobic conditions, which implies that substitution takes place before polymerization. Formation of quinones and substitution of H by OH in the benzene ring may be facilitated by an alkaline environment. 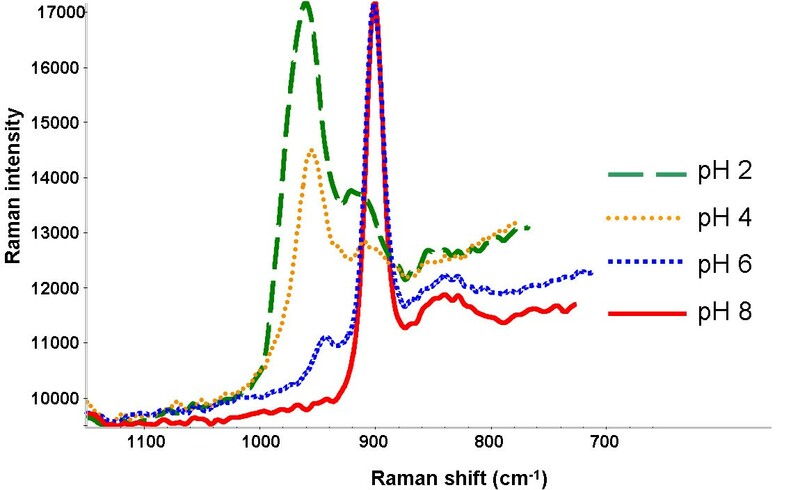 Raman spectra of six month old uranyl/catechol solution were obtained to investigate the effect of time on complexation. All the characteristic peaks of polymerization of catechol were observed even at pH as low as 2 (Figure 11), whereas a pH of 6 was required for immediate polymerization. Polycatechol formed was found to have precipitated out of solution, likely forming humic-like material. No uranium was found in the precipitate; all the uranyl remained in solution after the polymerization was complete. Hence the uranyl ion in solution acts as a catalyst for formation of polycatechol over time (even under quite acidic conditions) by complex formation with oxygen from hydroxyl and quinone groups. In presence of uranyl ions, polymerization was observed even at pH 2 with time. This is likely due to complexation of catechol by uranyl ions with subsequent transfer of electron density from the benzene ring towards uranyl, hence facilitating removal of H (figure 12). This is consistent with observations by Horsman for catechol polymerization catalyzed by Fe(III) or by Arana for polymerization catalyzed by CuO-TiO2 [38, 39]. After complexation and removal of a second hydrogen from catechol, double bonds between carbon and oxygen atoms are formed with the negative charge on oxygen resulting in quinone and tropone complexed to uranyl ion. This process is associated with depletion of electron density around a neighboring carbon atom in the ring, in turn resulting in formation of a single bond with dissolved oxygen. In the next step, an increase in electron density around an adjoining carbon atom leads to formation of a C-C bond between two molecules of catechol. This is the initiation of polymerization -- the process continues as uranyl associates with the resulting dimer, in turn leading to C-C bonding with additional catechol and so forth. Polymerization of catechol may also be influenced by the formation of a localized zone of high pH generated by abstracting protons from the solvation shell present around uranyl ions. Recent collaborative work with Kubicki, et al., indicates the inclusion of not only a primary but also a secondary solvation shell of from 20 to 30 water molecules is necessary for accurate quantum mechanical molecular modeling for uranyl-organic ligands, including uranyl-catechol . Proposed mechanism of initiation of catechol polymerization in presence of uranyl. While further study is needed for developing accurate models of the kinetics of long term uranyl association with aromatic molecules with phenolic ligands, this result has a number of significant implications. These include (a) understanding uranium sorption and transportation in surface and some subsurface environments, (b) optimizing the operation of any remediation process which either uses organic ligands or which is used to remove contaminant uranium from groundwater containing natural or pollutant organic material, and (c) for understanding the humification process through oxidative coupling of phenols, as this result shows that uranyl ion can act as a catalyst in the process of polymerization with complexation between catechol ligands and uranyl acting as an intermediate step. This work has been supported by U.S. Department of Energy Office of Science Environmental Management Science Program (EMSP), contract number DEFG0204ER63729 and the Center for Environmental Molecular Science, (CEMS) funded by the National Science Foundation, contract number CHE0221934. PKJ designed the experiments acquired and analyzed the data and drafted the manuscript. GPH contributed with conception, revising the manuscript and gave final approval of the version to be published.